In the market for 2014-2015 E550 BiTurbo, what to look for? Hey guys, i'm starting to do research on getting a preowned W212 E550, what are common issues concerns regarding this model? I'd be getting a coupe, RWD if possible but will take 4matic as well, prefer RWD though. These cars are total sleepers and once tuned, i heard can do some serious performance. I would like to find one with about 60K miles on it or so. Currently driving an R230 V12TT and a couple of Toyotas. I am a pretty good mechanic, minor problems aren't of concern, just drivetrain reliability issues. Firstly, there is a specific forum section for coupes, this is the Sedan section, but basically the same car. I bought a 2012 biturbo 4matic, because the sedan only comes in 4matic with the 550 from 2102 to the last year of 2014. The same rules apply to buying any used car around 60K miles. It should have a Carfax free of accidents, or at most a minor fender bender, but hard to tell the extent of damage if an accident is reported, so look for none preferably. Carfax should also show all history of car being serviced at a dealer. If you find one with consistent dealer service intervals of 10K with no major repairs, just the normal wear stuff, then you're probably good. I also live in the south, so I didn't consider anything from anywhere that has snow, it leads to numerous issues from rust and corrosion that I just avoid. I had a 2000 model CLK430 that lived in FL all it's life and had zero corrosion anywhere. I ended up buying my E550 at 67K miles from Houston TX, because it was the cheapest I could find in the south for a biturbo E550. It was at a Porsche dealer, had no reported accidents, and regular dealer service intervals from one owner. I'm now at 92K miles and haven't fixed anything but replacing brakes, tires, spark plugs, and air filters. I expect to have it for quite a while because I don't see anything in the same class I would rather own. If I wrecked it tomorrow, I may consider a CLS550, but most likely would go for the holy grail of 1yr only combination of E550 sedan with facelift body, and look for more of the fancy options, as mine is kind of basic in options as far as MB goes. The E550 biturbo sedan was only sold for three model years - 2012-2014. All of them were only in 4wd. The 2014 is the last year and is post-facelift. I love mine and other than some minor issues it has been bullet proof. I love the car but be aware that in DC rush hour traffic it drinks gas (SUV like mileage). On the highway it is pretty good. Gotcha, i'm chasing after a W207 coupe, posted in the wrong forum, I have a tundra and land cruiser and the V12 benz so none of my vehicles get more than 12mpg, but it is what it is. I'm just worried about the drivetrain reliability, im a mechanic i can fix and repair maintenance items, as long as the engine/trans are good i'll be okay with fixing little issues. Same engine/trans in the W207. My E550 4M sedan has been solid as a rock. Any problems with buying one that's around 60-70K? These have airmatic suspension right? or regular shocks and springs, my R230 has horrible ABC issues. Shocks and springs, unless special ordered unlike the earlier (pre-facelift) version where they all came with Airmatic. ABC is one of those Airmatic type systems that can ruin many weekends chasing down issues. I can't see where 60-70K miles would be an issue. You will be into plugs and transmission fluid change, and may want to check the motor/trans mounts closely. If it has been well maintained and those items taken care of then go for it. The tunes are now coming via OBD and no more sending in the ECU. I'm still under warranty, but will release the beast when that's up. Your SL is the bomb. Last edited by KEY08; 03-04-2019 at 05:01 PM. OH man tell me about it, ABC was leaking all summer, i spent many many hours underneath my car replacing hoses, which is cramped as hell in that V12 engine. Just recently replaced the water pumped, had to get a special crank pulley tool to get to the last bolt. MB don't make it easy on DIYers, that crank pulley was torqued to like 10,000ft lbs. 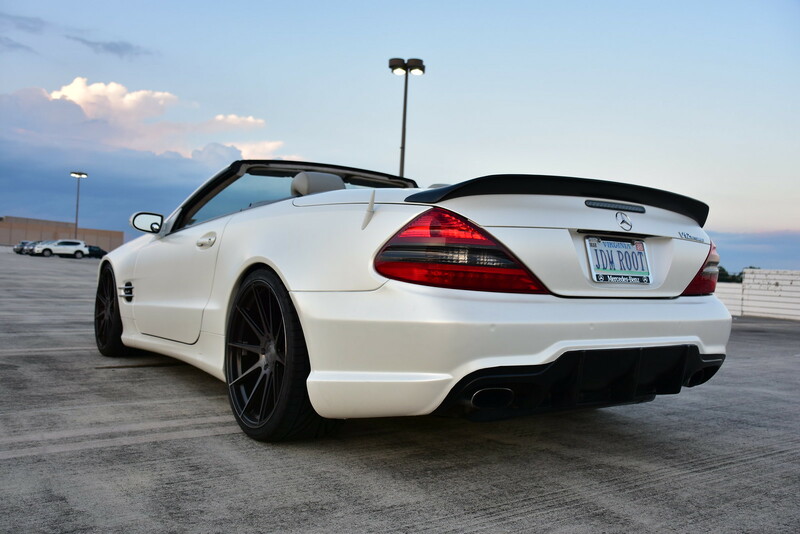 Looking forward to getting something newer, more simpler to work with, i imagine with a tune an E550 will be just as fast as a V12 SL. I know Eurocharged is doing tune via OBD, but it's not a device they sell you so you can change it on demand like a Cobb. Sounds like it's just an interface for their computer, rather than removing that ECU box. Not really much advantage until someone comes out with a Cobb type handheld DIY device via OBD for MB, that would be awesome! I was reading that Renntech gives you a unit like Cobb for the OBDII, it's 2400 for a stage 2 tune, you can flip between stock mode and **** your pants mode. Oh really? Any concrete info on this? I don't want my car to be tuned all the time, I want to be able to activate it on demand. Like a super sport mode. Or at least a 5 minute deal with a handheld device when my wife is going to take the car. Concrete evidence is on the Renntech site. 540 HP/705 ft lbs. for $2480. Best deal going. No ECU in the mail crap. That's more than my Shelby and some serious HP. Last edited by KEY08; 03-07-2019 at 10:52 AM. Well, that's a huge step forward. Unfortunately it's still a bit rich for my blood. If they can get it down to the $650 cost of a Cobb Access Port device that the BMW guys have enjoyed for years, then I'd be all in. The Cobb also has a LOT more features than this dummy flash device. Whats the reason for you to go from V12TT to E550 BiTurbo ? This is really getting interesting! Thanks guys. Quick Reply: In the market for 2014-2015 E550 BiTurbo, what to look for?